Since 2015, SS2020 has been working to generate a community-integrated vision of education to benefit the children of Sackville. Lots of consultation and research has resulted in the Community Learning Campus model idea. Below are answers to some frequently asked questions related to this vision. Click each question to expand it and see the response. We are teachers, parents, local business owners, principals (former and current), students professors, and community members. We have been meeting for over three years, consulting with education experts, school architects, and visionaries in Sackville and beyond. We have done extensive research into 21st century education and are working to ensure that children in Sackville have the best schools possible. Knowing that Marshview will close, we want to create a local solution that supports our teachers and students with inspiring learning and teaching spaces. See our Community page for more information. Sackville has an amazing opportunity to lead the change in how new schools are designed in New Brunswick. 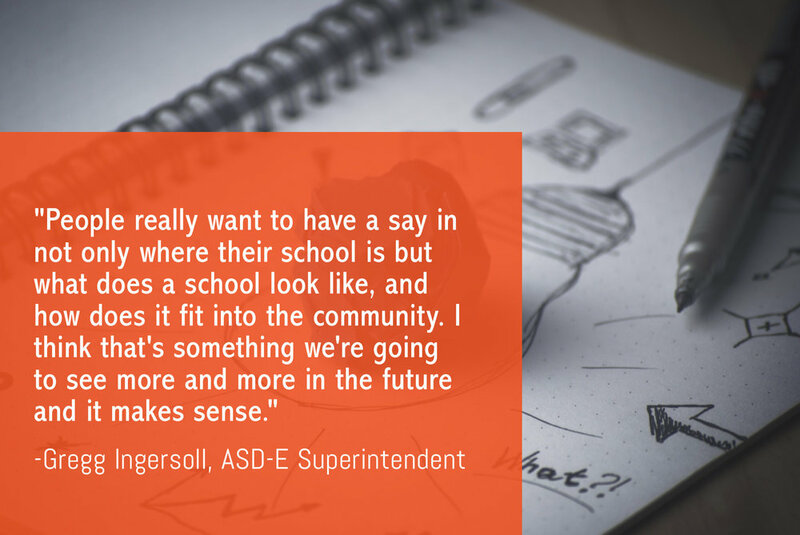 Many people, including the ASD-E Superintendent, acknowledge that it’s time for more community input into school design. We acknowledge the shift happening in our schools towards a curriculum based in “Deep Learning”, and know that a community-based education model that includes all grade levels will further efforts to better prepare our children for an ever-changing world. A Community Learning Campus, designed with input from the community, would bring many benefits to the town, support our teachers, and help our students thrive. The SS2020 website has had almost 10,000 unique visitors (with over 18,000 page views). There is clearly a lot of interest in the SS2020 vision, on a local, national and international level. The SS2020 Community Learning Campus idea is grounded in research and consultation. Over the past 3 years, we have been consulting with experts and interested community members through meetings, discussions and workshops. The community consultation process is not, by any means, complete, but the information we have gathered so far has helped us to suggest some of the specifics that you will read about below. Moving forward, Community Visioning Sessions will provide feedback on considerations like location, grade configuration, and needed and desired facilities. It would cost millions of dollars to fix Sackville’s current schools to update them to a healthy state. Wouldn’t it make more sense to invest that money into constructing new schools that are designed for 21st century learning and can meet the needs of our students for the next 30+ years? We want to build new, integrated facilities to maximize opportunities for our students, who navigate a much different world in terms of technology, environment and job prospects than their parents. Our Community Learning Campus model is designed to be revenue-generating, cost effective, resource sharing, and energy efficient. This is the best use of money in the short and long term. Rather than being a “cadillac model,” then, this is the most efficient, best designed vehicle for moving our children into the future! Educational architect Greg Hasiuk wrote a great article for our blog about the principles of modern school design. There are numerous funding models available, and we are currently discussing possibilities with investors, developers, federal government representatives, economic development experts and others. The SS2020 model is ideal because it will allow us to access funding from a variety of sources. For instance, in the Community Learning Campus, Provincial and Federal monies could be accessed. How? The proposal is seen by the federal government to be an infrastructural investment in the community, not just in education for Sackville. As such, they can support arts facilities, apprenticeship and trades programs, community programming and learning spaces, recreation and health facilities and more. The SS2020 model also allows the group that manages the Campus (a non-profit organization) to advocate for the Sackville community and seek funding from non-profit granting bodies and government programs. No, this would not be a typical P3 build. The Campus would be run by a non-profit organization, with representation from the town, schools, government, community, etc. We would, however, be seeking to work with a developer who has experience with building schools and 21st-century learning facilities in NB. Why do this? This route would decrease the wait time for construction and would allow community members to influence decisions on location, facilities and design. In contrast, the usual process allows little meaningful community input, typically follows a cheapest-is-best equation, is based on imprecise data and outdated school design principles, and is not always very reliable. According to the former Minister of Education, no school they have ever built has opened on time or on budget and many, such as Moncton High, continue to have significant issues associated with the building and design standards used. No, a huge, single school building is NOT what the Community Learning Campus is about. A campus means that there would be multiple school buildings or “communities” of learning groups within an overall campus structure. That way, we can best cater to learners of different ages, but also share resources and benefit from other ages in supervised, mutually-beneficial activities (mentorship, tutoring, coaching). There is much research that supports the value of having students from K-12 share a campus, with benefits like increased parental and family member involvement, better attendance, improved behavior, healthier social adjustment and sense of belonging, and academic achievement. It is also cost-effective and recognizes that we need efficiency in our infrastructure. The well-being of all children is of central importance. Grade configuration will be a community decision, and we propose drawing on advice from educators and research for the best solution. However, we do suggest including all grades/students in the decision about new schools, as opposed to only those in certain grades. In other words, rather than just replacing Marshview and “hoping for the best” for our other schools into the future, we advocate being proactive and creating modern educational infrastructure for all students in Sackville—and students from neighbouring communities who will attend high school here—now. K-2 play-based groups with their own facilities; grades 3-6, 7-9 and 10-12. The decision would be based on different student needs, teaching resources, learning requirements, etc. This model will allow us to be more inclusive by considering all learners in our community. Read our blog post for more information about the benefits of K-12 sharing a campus. Sports: After-hours sports programming shows us that there is high demand for athletic facilities with multiple gym and field spaces. An athletic facility that can accommodate all school populations plus other town sports activities is a must. Within the Community Learning Campus, possibly in collaboration with Mount Allison, we would like to make sure that adult users can have access to sports facilities too, such as courts for indoor racket sports, or community soccer. Outdoor education/wetlands: Outdoor learning is an important part of the SS2020 vision and there is much research to support its value for students of all ages. Consequently, we feel that the Tantramar Wetlands Centre and other similar programs and facilities need to be integrated into new learning facilities in Sackville. Acknowledging outdoor education as central to our curriculum is part of the current move towards “deep learning” that is occurring in our province. SS2020 supports this 100%. Theatre: We know that current theatre spaces at existing schools are not ideal, in terms of space for performances and for audiences. Many community members have also voiced the need for a performance space for local theatre groups (and a large enough space for audiences). Depending on the location, the new Campus could make use of existing theatre space at MtA, or involve a newly-built space for school and community use. Shop/Trades: Vocational training is more important than ever. Although TRHS has decent facilities, more central facilities that can be used by the community would be beneficial. These would enhance and expand the potential for students to explore their interests in this area. New facilities could connect High School curriculum, local apprenticeships programs and community classes in ways that are instructive and exciting for students of all ages. We have been consulting with shops and trades officials at Post-Secondary Education and Training and Transitions Canada on these possibilities. The Wetlands Centre would be integrated into the new campus vision as it is an important part of what makes education in Sackville wonderful. For instance, The Wetlands Centre could be relocated to the other side of the highway, so that (if the school is downtown), students could walk to it easily. Alternatively, a new wetlands could be created if the campus is not located near existing wetlands. The soil in the Tantramar region would support the creation of a new wetland almost anywhere, and these ecosystems are productive in a very short timeframe. There are many examples of schools integrated into their local community and lots of ways in which security protocols can be managed in these contexts. Sometimes a safety and security design committee is established with representation from the school district, the community and local stakeholders to ensure that standards are met and concerns are addressed from the very beginning of the design process. A concrete example is the new Seaside School in Saint John, where the school district formed a PSSC-Community-School safety and security committee as part of the school design and development process. There is a CBC article available with more information (read the article). The standard new school design process—driven by the DEC/ Department of Education and based out of Fredericton—does not allow for input from the community on location. In contrast, our community-based model proposes that the local community help decide the location of new school facilities. For several years, we have been working with architects, town planners, developers and local community members; from our work so far, two exciting locations have emerged as the possible location for the Community Learning Campus. Of course, no specifics can be decided upon until the actual visioning and community work commences. The key here is that the community would have a voice. Possible Location #1: A new campus in downtown Sackville. Consultation with architects and local property owners indicates that a campus model could make use of considerable space in a central location. The benefits? Our students can be centrally located and can access a range of nearby community facilities and resources. Many more students will be able to walk to school and to after-school activities. This central location makes the creation of an adjacent community centre ideal. The possible partnerships and shared facility agreements between the town, the university, the province and the federal government for public space, meeting space and rental facilities are endless. Possible Location #2: A new campus on the vacant land (40+ acres) at the corner of Salem and Queens Road. The benefits? This area could easily accommodate several school buildings and shared athletic and arts facilities. There is a wooded area that could be used for outdoor learning. Sackville’s schools are not necessarily given priority by the DEC over other needs in the region. Superintendent Gregg Ingersoll said recently at the Oct. 16 public information meeting that the process for school builds in Sackville could take “four to six to eight” years—if there is money available at that time. This is not fast enough, in our opinion! SS2020 would pursue a private developer/lease agreement to get work started and completed much sooner. The Community Learning Campus is also a project that will not rely on the Department of Education as its sole source of funds. Construction could begin as early as 2020, following a series of Community Visioning Sessions. Very exciting! A Non-Profit Corporation would manage the community centre that houses the new schools. This is a model that exists already in NB, and has proven to be very successful (e.g. Carrefour Beausoleil in Miramichi). Sackville 20/20 is a registered NB non-profit organization that could manage the campus, scheduling facilities, and creating opportunities for town use of, for example, fields, a theatre, and so on. Sackville 20/20 would have representation from the town, schools, DEC, government, community, etc. Why not let the Dept of Education run the schools? While the Department of Education and the Anglophone East School District would still be responsible for the administration and operation of our public school programs and staff, being overseen by a non-profit organization allows our Campus to manage and fully maintain its shared spaces, to create jobs, and to generate revenue. Revenue generated can be used to support the upkeep of the schools and to support programming in our children’s classrooms. For example, rather than relying on narrow budgets for special projects (e.g., Marshview’s new Engage! project) or for bussing for field trips, the Campus will have funds of its own for these purposes. Local management also increases autonomy and allows the facilities to be used by a broader range of stakeholders. As a leaseholder in the facility, our schools would receive immediate attention from the building managers for maintenance, repairs, changes to facilities based on changing demographics, technology provision and maintenance, etc. This is already successfully done in dozens of schools that we have studied (and much appreciated by principals and staff at those schools). The world is changing rapidly and the research shows that older education systems are not adequately preparing students for the future. A Campus model would help further “Deep Learning” efforts being made by teachers. A community-based education model that is designed for the 21st century will better prepare students for success, help them find their passions and empower them to be engaged citizens. There is growing evidence for the need for decentralization in education—a move towards a more community-centred focus—for the many benefits of using local knowledge and resources to enhance students’ learning. A community-designed space would ensure that local assets and considerations are incorporated into the new school/community spaces, rather than having the Dept. of Transportation and Infrastructure use a traditional “cookie-cutter” approach to design. Having a local non-profit manage buildings could ensure they oversee repairs and updates made to new buildings. In addition, teachers and principals will be supported by the non-profit in dealing with concerns that arise in their schools (as is the case with similar models elsewhere in NB). There is much information that shows that learning environment affect student well-being. By incorporating cultural elements from First Nations, Acadian, Anglo-saxon, etc, cultures into the design of the space, more students would feel welcome and more comfortable while at school. Research proves that light-filled, environmentally-friendly, beautiful learning spaces have a positive effect on mental health and also improve student academic performance. Students and teachers would be much happier spending their days in beautiful spaces that support modern learning and teaching methods. An integrated community space will allow for range of mental health support services to readily available and accessible to teachers and students. The DEC has voted to close Marshview and examine the possiblity of expanding Salem to a K-8. While we wait for the Minister to decide whether to approve this recommendation, SS2020 will continue to consult with members of the community and NB leaders on next steps. On Dec, 19th, the Atlantic Canada Opportunities Agency (ACOA) regional Vice President and his team will be meeting with Mayor Higham, Mount Allison representatives and SS2020 to further develop the visioning and planning stages of the Community Learning Campus model. We continue to work directly with our schools in Sackville, Dorchester and Port Elgin in assisting them with the move towards pedagogies for deep learning. We are also presenting our community-based education model to a number of other communities and individuals in various jurisdictions, assisting them in moving forward on community-supported education for 21st-Century learning. Fill out the contact form on the website to ask questions or make a comment. Come to a meeting and ask your question. These are some of the ways you can help or get involved. Come to our meetings. Follow us on Facebook to keep up with what we are doing and when we are meeting.